The majesty of the Canadian Rockies unfolds on this thrilling reel. You’ll witness one marvel of nature after another as you cycle among snow-covered summits, glistening lakes, rushing rivers and dramatic cascades. Visit Jasper and Banff national parks, with rides along the famed Icefields Parkway and Bow Valley Parkway. Stop along the way to take in the splendor of the enormous Columbia Icefield as it straddles the Continental Divide, the torrent of Athabasca Falls, the glassy surfaces of Maligne, Louise and Peyto Lakes, and so much more. Join VBT on this soul-stirring itinerary! This tour offers options on easier terrain with occasional hills and the opportunity for some longer rides and moderate climbing. The majority of the rides are on paved park roads alongside vehicular traffic, some with designated bike routes or a wide shoulder. Our VBT van support shuttle is always available throughout the trip. Depart from home for Edmonton, Alberta, Canada. Upon arrival at the Edmonton International Airport (YEG), claim your luggage and clear customs. Make certain your VBT luggage tags are clearly visible so that our VBT representative can identify you. If your luggage is lost, file a claim with your airline’s luggage service counter before leaving the customs area. VBT representatives are not allowed into the customs area. After exiting customs, enter the arrival hall and look for your VBT representative, who will be holding a sign with your name and VBT logo. He or she will walk you to your arranged transfer, which will depart from the Arrivals level near Doors 9 and 10. The transfer to your centrally located hotel is a journey of approximately 30 minutes. The rest of the day is yours to explore Edmonton at leisure, using the VBT City Information as your guide. All meals are on your own today. Our centrally located hotel lets you explore Edmonton, Alberta’s lively capital, with ease. Simply step outside and the city’s cultural pleasures are a short walk away. In the summer, parks come alive with some of Canada’s most colorful festivals. You might catch the nationally famous Fringe Festival, the Street Performers festival, and jazz and blues festivals. The city’s science center houses the largest planetarium in the country. Take a break from exploring at BRU Coffee and Beer House on Jasper Street. At Louise McKinney Riverfront Park, you can pick up the city’s beloved trail system and follow it throughout the city. Perhaps you’ll explore the World Walk, a horticultural stroll that includes a serene and visually striking Chinese garden that celebrates Edmonton’s Chinese community. VBT Air Package guests: Enjoy a leisurely breakfast at your hotel, then meet your VBT representative and the rest of the group in the lobby at 9:00 a.m. for your transfer to Jasper (travel time is approximately four hours). A box lunch will be provided. Please come dressed for cycling (with your pedals or saddle if you use your own), as there will be no place to change into cycling clothes before the warm-up ride. Check-in at your hotel is 4:00 p.m.
Once you arrive in Jasper, in the heart of the breathtaking Jasper National Park, meet your Trip Leaders for a safety and bike-fitting session. Then set off to stretch your legs on an invigorating warm-up ride. As you cycle, the true majesty of the Canadian Rockies reveals itself as snow-capped peaks rise around you. Your destination is Pyramid Lake, the pristine waters at the foot of Pyramid Mountain, so named for its shape. Raise a glass to your arrival in the splendid Canadian Rockies during a special welcome reception, followed by dinner at Whisky Jack, a local restaurant. After a hearty breakfast, gather in the lobby for a breathtaking hour-long transfer, climbing some 2,000 feet to our ride’s starting point at Maligne Lake. Before you get underway, linger a while to admire the vibrant blue waters and the magnificent peaks that ring the largest glacially fed lake in the Canadian Rockies. You’ll be inspired by the beauty of Maligne Lake’s still waters and by the stunning lofty peaks around you. Begin your reel along Maligne Lake Road and look for the famous Rosemary’s Rock. Somewhat of a curiosity for its several film associations, this semi-famous river rock appeared in the 1953 movie, “Rose Marie” and it’s been said that Rosemary Clooney once climbed upon it. Continue riding along a magnificent road lined with deep emerald forest sloping up to massive mountains. This spectacular route leads to the famous “disappearing” Medicine Lake, a minor basin of Maligne Lake whose waters drop off underground at one end. Pause here to stroll along the shoreline and watch for pika, a tiny round rabbit-like mammal, hiding among the rocks. Down the road on the banks of the Maligne River, you will meet your Trip Leaders, who have prepared a picnic lunch. Enjoy your freshly prepared meal in this perfect dining room, keeping your eyes peeled for elk, mountain goats, bighorn sheep, and white-tail deer. Later, cycle to Maligne Canyon and hike some of the trails into the narrow 164-foot-deep karst ravine. Your inspirational day continues as you ride to Beauvert Lake, the setting for Jasper Park Lodge. Here, you can take a break to sip tea or libations on the patio and celebrate the staggering beauty of the park. You may ride or shuttle back to your inn. Tonight, dinner is on your own at one of Jasper’s many fine eateries. You may find such pleasurable appetizers as Earl Grey smoked candied salmon, Newfie cod cakes, or P.E.I. mussels. Or sample such exquisite dishes as slow roasted prime rib, AAA Alberta beef, back ribs, deer tenderloin, wild boar chops, or rack of lamb. The choices in Jasper are endless. Your Trip Leaders will be happy to help you with recommendations and directions. Awake to the cool mountain air and head to the inn’s restaurant for breakfast. After fueling up for the morning ride, depart Jasper to begin cycling the Icefields Parkway, one of the world’s most beautiful roadways. This astonishing route traverses the heart of the unspoiled Rockies, passing panorama after panorama of jaw-dropping alpine splendor. As you ride, marvel at glacier-crowned summits, plummeting waterfalls, and azure lakes surrounded by spruce and fir forest. Your destination is Athabasca Falls, one of the park’s most powerful waterfalls for the torrent of water that spills into its gorge. The Athabasca River carries the most water of any Rocky Mountain river, and the 75-foot falls present a spectacle of roaring water, spray, and mist. There’ll be time here to hike along marked trails to viewing platforms and marvel at the deep canyon carved by the power of the mighty river. It’s the ideal spot for a picnic, and so you will enjoy lunch here near the falls. After this refreshing stop, continue cycling the Icefields Parkway amidst more views of snow-capped mountains. Later, arrive at the friendly and rustic Sunwapta Falls Rocky Mountain Lodge. Settle in to your cabin-style room and perhaps walk to Sunwapta Falls, just a seven-minute walk from the lodge. Tonight, enjoy a talk about Jasper National Park from a naturalist, followed by a delicious traditional barbeque dinner. After sunset, the night sky puts on a show of infinite stars. After breakfast, enjoy a scenic shuttle along the Icefields Parkway to Lake Louise. En route, you will stop to view the spectacular Columbia Icefield. Formed during the Great Glaciation, this vast natural wonder straddles the Continental Divide along the border of British Columbia and Alberta and is the largest ice field in the North American Rockies. This is nature at one of her most extremes: the ice that comprises this 125-square-mile expanse between glacier-clad peaks is up to 1,200 feet deep and receives up to 23 feet of snow annually. From a viewing platform, you will see Mt. Athabasca, North Twin, Mt. Andromeda, and Mt. Kitchener. After time here, continue by shuttle into Banff National Park, pausing to witness the mesmerizing green-blue waters of Peyto Lake, colored by particles of glacial rock that flow into the lake each summer. There’ll be time to follow the paved trail to a breathtaking lookout point over the lake, named for an early trapper in the Banff area. Later, arrive at Lake Louise, enjoying your box lunch along its iconic shores. This is one of the most famous lakes in the world, renowned for its magnificent setting. The glacier-fed waters were named for Princess Louise Caroline Alberta, the fourth daughter of Queen Victoria. After lunch, shuttle a little further down the road and return to your bicycle saddle for an invigorating, mostly downhill ride along the magnificent Bow Valley Parkway. This stunning wilderness corridor is celebrated for its unwavering preservation of Banff’s scenic heritage. As you descend, you may pause off the road at interpretive stops, perhaps learning more about sites like Morant’s Curve or Castle Cliffs as you gaze upon them in the distance. You might hike to Johnston Canyon, formed by rushing water 8,000 years ago and one of the popular walking experiences in Banff. Choose a 20-minute easy walk to the lower falls (0.6 miles/1.1 km roundtrip) or a 45-minute hike to the upper falls (1.7 miles/2.7 km roundtrip). Later, approach the Flames of Life, an area where prescribed burns have been used to stimulate plant growth and support natural habitats. After a rewarding day, arrive in Banff, the highest town in Canada, and your lodge for the next two nights. Tonight, dinner is at your leisure in town. Your Trip Leaders will point out their local favorites. Today, you spend time in the scenic area in and around Banff, with several ride options available. Enjoy an easy, flat spin around the beautifully manicured Banff Golf Course. During this leisurely ride, you might spot majestic Wapiti, a species of elk, along the fairways. Later, continue with a reel along the Bow River to its pretty Falls. Take a spin to Tunnel Mountain, a small summit rising over the town of Banff. From the top, linger a while and admire views over the Bow and Spray River Valleys, Banff Springs Golf Course, and surrounding peaks. This afternoon, continue to Lake Minnewanka, meaning “water of the spirits” in the First Nations Nakoda language. Surrounded by jagged peaks and hoodoo clusters, it is the longest lake in the Rockies. Back in Banff, optional activities include a visit to the Cave and Basin National Historic Site, where natural thermal springs have a rich local history. Embark the Banff Gondola to the summit of Sulphur Mountain. Or pay a visit to Whyte Museum to learn about the cultural heritage of the Canadian Rockies. Your lodge offers complimentary bus passes to facilitate your visit. You might stay close by and find local souvenirs in town or find solitude and calm at the lodge’s Red Earth Spa. For spa appointments call 1-800-563-8764; advanced reservations are recommended (spa treatments not included in the tour). Tonight, gather at Juniper Bistro for a farewell dinner and celebrate your unforgettable alpine adventure. Enjoy a final breakfast at the Banff Caribou Lodge. Your transfer to the Calgary International Airport (YYC) departs from the Banff Caribou Lodge at 9:00 a.m. (Travel time is 1 hour, 30 minutes.) You will arrive at approximately 10:30 a.m. for your return flight. We recommend a flight out of Calgary no earlier than 12:00 p.m. (noon). VBT-Bicycle-Vacation-only guests: At 9:00 a.m., meet your VBT representative in the lobby of the Coast Edmonton Plaza Hotel (10155 105 St NW, Edmonton, AB T5J 1E2, Canada telephone + 780-423-4811). Please come dressed for cycling (with your pedals or saddle if you use your own), as there will be no place to change into cycling clothes before the warm-up ride. Transfer to Jasper at 9:30 a.m. promptly (travel time is approximately 4 hours). A box lunch will be provided. Check-in at your hotel is 4:00 p.m. If your arrival at the Edmonton hotel is scheduled for later than 9:30 a.m., or if you are delayed, you must travel to the Jasper hotel at your own expense. SunDog Transportation and Tours Ltd. provides a daily shuttle service between Edmonton International Airport and Jasper National Park ($99 CAD per person). Sundog Tours picks up at Door 10 on the Arrivals level at 3:15 p.m. or in the lobby of Fantasyland Hotel at West Edmonton Mall at 3:50 p.m. ($89 CAD per person). You will arrive in Jasper at 8:00 p.m. and dropped off at your hotel. Reservations are required. Call + 1-888-786-3641 or visit http://www.sundogtours.com/edmonton-edson-hinton-jasper-shuttle-services/. 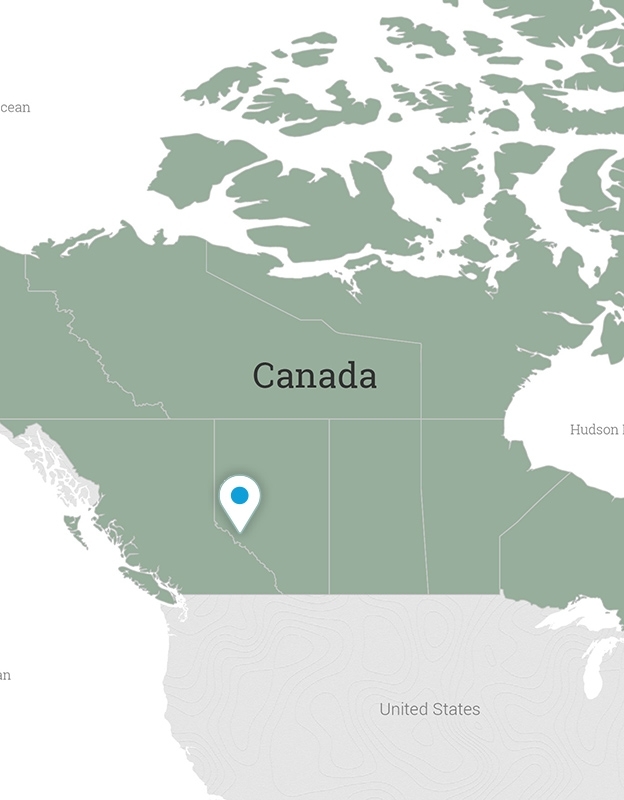 Your Jasper hotel is The Crimson Jasper (200 Connaught Drive, Jasper, AB T0E 1E0, Canada, telephone +587-802-3577). Please contact The Crimson Jasper to advise them of any travel delays or changes, and the staff will pass your message on to your VBT Trip Leaders. Once you arrive in Jasper, in the heart of the breathtaking Jasper National Park, meet your Trip Leaders for a safety and bike-fitting session. Then set off to stretch your legs on an invigorating warm-up ride. As you cycle, the true majesty of the Canadian Rockies reveals itself as snow-capped peaks rise around you. Your destination is Pyramid Lake, the pristine waters at the foot of its eponymous mountain, so named for its shape. Banff Caribou Lodge and Spa is located in the center of Banff within walking distance of all the sites in town. This 184-room mountain lodge features magnificent views of the mountains of Banff National Park. The Keg Steakhouse and Bar is the ideal place for a hearty meal after a day of cycling. The full service Red Earth Spa features a steam room, a 26-person jetted hot pool and an exercise room. As a guest, you will enjoy the use of a complimentary “Roam” bus pass, your ticket to several attractions outside of town. For spa appointments call 1-800-563-8764; advanced reservations are recommended. Coast Edmonton Plaza Hotel is a full-service hotel located within walking distance of the citys many arts, dining, and entertainment venues. Inspired by a long hotelier tradition, the attentive staff is genuinely hospitable and endlessly helpful. Enjoy newly renovated rooms during your stay with all the amenities you need. Dine in the relaxing restaurant. And treat yourself to a treatment at the luxurious day spa and fitness facility with a whirlpool hot tub, steam room and salt-water pool. Nestled in the heart of town lies Jaspers newest hotel, The Crimson Jasper. This 99-room hotel exemplifies the casual nature of park accommodations and true Canadian colors, awash in the hues of Jaspers sunsets, fall foliage, the Canadian flag and the uniform of the Royal Canadian Mounted Police. The inn features an indoor pool, hot tub and Peak fitness room. In the evening, enjoy a drink in the new C200 restaurant and lounge. 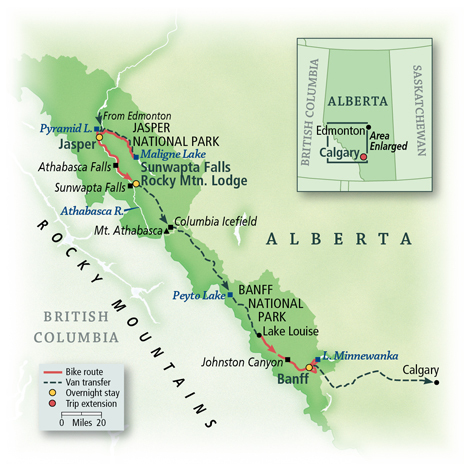 Located on the Icefields Parkway, the Sunwapta Falls Rocky Mountain Lodge enjoys a splendid setting right on your bike route. The modest and rustic lodge offers simply furnished cabin-style rooms. The property has been awarded TripAdvisors Certificate of Excellence for four years running and has received the annual AHLA Housekeeping Award for decades. The friendliness of the staff is sure to win you over, as is the tranquility: you wont find cell phone reception here, though free WiFi and satellite television are available. Once youre settled in, enjoy a seven-minute walk to the scenic Sunwapta Falls if you wish. After breakfast at your Banff hotel, your transfer to Calgary will depart at 9:00 a.m., arriving at your downtown Calgary hotel at approximately 11:15 a.m. VBT has arranged for two drop-offs: first at the Calgary airport for VBT guests returning home, then at your Calgary downtown hotel. After settling in, you can explore this sophisticated city with ease, walking to many of its landmarks and attractions from your hotel. Browse the art collections at the Glenbow Museum. Ascend the Calgary Tower for splendid city views. Wander among the shops on Stephen Avenue, lined with historic buildings. Or explore Prince’s Island Park, a peaceful urban green space in the Bow River. This evening, you will have many options for dinner on your own. After breakfast*, transfer to the Calgary International Airport for your flight home**.